Veins are very close to the surface of skin, which helps them play a role in heat dissipation. Due to this closeness to the surface, they are very visible through the skin. 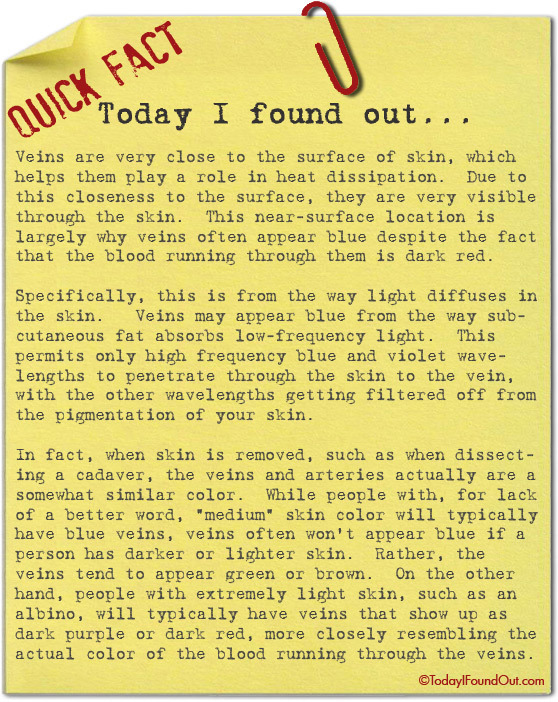 This near-surface location is largely why veins often appear blue despite the fact that the blood running through them is dark red. Specifically, this is from the way light diffuses in the skin. Veins may appear blue from the way subcutaneous fat absorbs low-frequency light. This permits only high frequency blue and violet wavelengths to penetrate through the skin to the vein, with the other wavelengths getting filtered off from the pigmentation of your skin. In fact, when skin is removed, such as when dissecting a cadaver, the veins and arteries actually are a somewhat similar color. While people with, for lack of a better word, “medium” skin color will typically have blue veins, veins often won’t appear blue if a person has darker or lighter skin. Rather, the veins tend to appear green or brown. On the other hand, people with extremely light skin, such as an albino, will typically have veins that show up as dark purple or dark red, more closely resembling the actual color of the blood running through the veins. I was always told that the reason that veins and arteries look blue is because the blood is blue inside and it comes out red once it is exposed. However, I had no idea that it had anything to do with how light diffuses in the skin. does this mean that the color of the blood is still different when inside than it is outside or is that idea completely wrong?